St. Marks one more time. The railroad and the fort. I went back to St. Marks to get some extra footage. First is the Tallahassee-St. Marks Railroad. Started running in 1837. First as a horse-pulled cart on rails. Two years later, a simple steam engine. 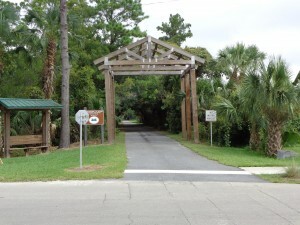 And incredible enough, the rail line operated for about 150 years until the 1980s, when it soon after became the first Rails-to-Trails multi-use biking and hiking trail in Florida. I remember when it happened. And I remember when a lot of the rails-to-trails that you see in Florida now, had trains running on the tracks. Times change. 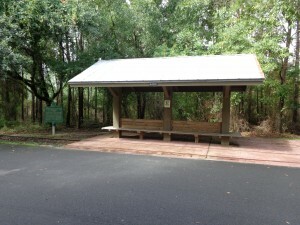 Here is the nice rest area for the trail by Capitol Circle highway. Looks like some nice side trials have been added from here as well, that go into the Apalachicola Forest. So you can go about 16 miles down to where the trial ends at St. Marks. For a brief period, there was a bridge built when the tracks were extended down to Port Leon, about 1838. 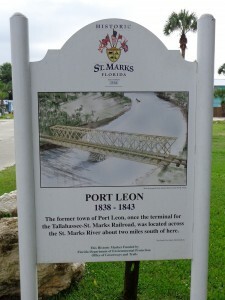 So Port Leon put St. Marks out of business for the shipping and sea port, but not for long, since Port Leon was destroyed by a hurricane in 1843. The rail ceased to go past here after that. End of the rail line. And one more visit at the fort. One more thing about the fort. Fort St. Marks, or San Marcos de Apalache. Think that the U.S. flag has flown over Florida since 1821? Wrong! The U.S. flag was flown over Fort St. Marks when General Jackson took it from the Spanish in April 1818. The fort was occupied by the American for about 10 months until they apparently gave it back to the Spanish and moved over to Fort Gadsden. Jackson would give St. Marks back to the Spanish, reluctantly, but since he had build Fort Gadsden, no way was he going to give that up. Fort Gadsden was in operation until about 1824. So the US flag has flown over Florida, even if it was unsanctioned military occupation, since 1818; 195 years. The main reason the US remained at Ft. Gadsden was to keep the river traffic open. One of Jackson's biggest contentions against the Spanish was keeping the river traffic open for shipping to ship supplies to the American forts and settlements further up river. (And also, he didn't want to be taxed by the Spanish, either!) And to keep a strong military presence to protect the settlers from Indian attacks. (Although the settlers still abandoned their homesteads.) According to the post returns, Fort Gadsden had a garrison anywhere from 278 men, down to 120. But the soldiers did not stay at the fort, but were kept on duty up and down the river, at the bay, and even over in Mobile at Fort Bowyer and Fort Charlotte.